Sunway Lagoon promotion for Colleges & Universities student! 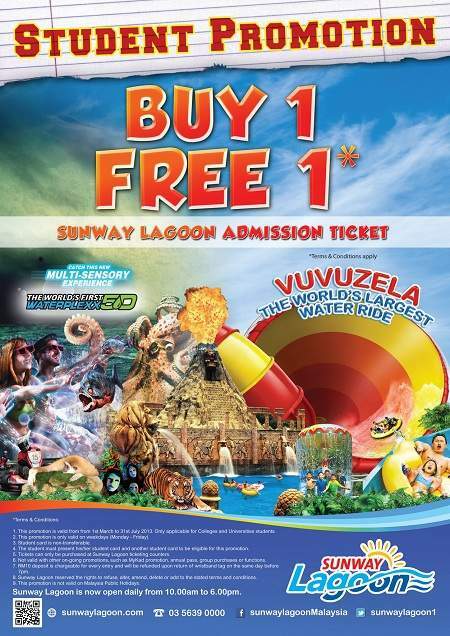 BUY 1 FREE 1 for Sunway Lagoon Admission Ticket! Catch this new Multi-Sensory Experience with THE WORLD'S FIRST 5D WATERPLEXX! Sunway Lagoon is now open daily from 10:00am - 6:00pm! This promotion is valid from 1st March to 31st July 2013. Only applicable for Colleges and Universitites students. This promotion is only valid on weekdays (Monday - Friday). The student must present his/her student card and another student card to be eligible for this promotion. Tickets can only be purchased at Sunway Lagoon ticketing counters. Not valid with other on-going promotions, such as MyKad promotion, annual pass, group purchases or functions. RM10 deposit is chargeable for every entry and will be refunded upon return of wristband tag on the same day before 7pm. Sunway Lagoon reserved the rights to refuse, alter, amend, delete or add to the stated terms and conditions. This promotion is not valid on Malaysia Public Holidays. Do you like Sunway Lagoon promotion?